Every May, without fail, the NFL storylines are the same. (Take, for example, “the most May 22 tweet of all time.”) A particularly common one is the raft of headlines shouting “[PLAYER] Is Skipping OTAs,” followed by reams of copy that purport to explain why, and what it all means. It means nothing. OTAs, or organized team activities, are a three-week phase of the NFL’s offseason program that occur in late May and early June. They come with specific restrictions: a total of 10 days of on-field practices that include position drills, 7-on-7s, 9-on-7s, and 11-on-11s, with no pads except helmets, and no live contact. Also—this is undoubtedly the most important part—OTAs are completely voluntary. The guidelines that govern OTAs are spelled out in the league’s collective bargaining agreement with the players’ union. The players negotiated terms that included a designation that OTAs would be completely and utterly optional. Players don’t have to show up, and they don’t even have to give a reason for not showing up. Nothing is mandatory until next month’s three-day minicamp, when players can be fined a maximum of roughly $80,000 for an unexcused absence. And once training camps begin in mid-to-late July, an unauthorized no-show will cost a player $40,000 per day. Players can be incentivized into showing up for OTAs by individually bargaining with teams to include workout bonuses in their contracts—bonuses that pay out if a player participates in all or part of the offseason program. But that’s it. Players cannot be fined, suspended, or disciplined in any way for skipping OTAs. Which is exactly what they bargained for. And yet, every May, without fail, it’s the same thing: Reporters and fans shaming players for not doing something those players ensured was optional, with many of those same reporters and fans working diligently to discern some ulterior motive for any of the absences. True team players would be there, the thinking goes, as though the baseline definition of True Team Player in a cutthroat, $14 billion business were to begin somewhere above and beyond a contractual obligation. 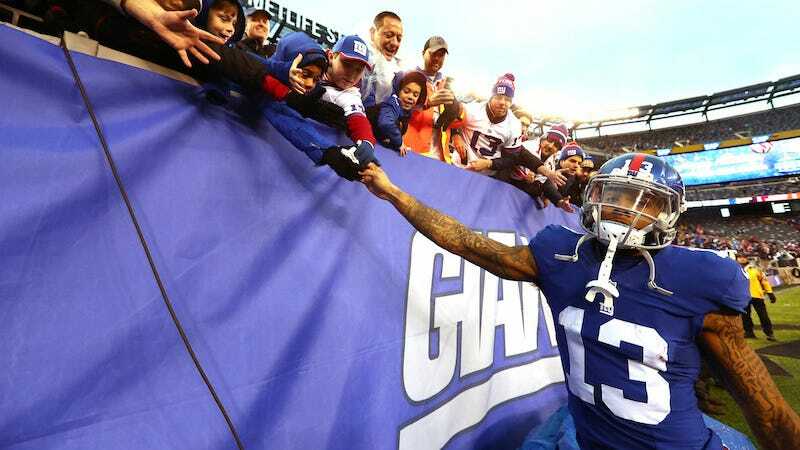 Take Odell Beckham Jr. He missed the first two days of Giants OTAs on Monday and Tuesday, and he’s expected to be back for Day 3 tomorrow. But that hasn’t stopped fans from tsk-tsking Beckham by framing this news with his no-show at Eli Manning’s annual passing camp last month and a recent photograph of Beckham with Johnny Manziel, who sometimes uses the same trainer. Sometimes, when a player is unhappy with his contract, or with the status of negotiations, that player will avoid OTAs. It’s one of the few stabs at a boycott individual players can attempt without being fined, but it’s ephemeral, because—again—those players don’t have to be there in the first place. The most easily overlooked part of all this? Skipping OTAs doesn’t affect performance, and it definitely doesn’t affect future earnings. Troy Polamalu regularly did it. Same with several prominent ex-Ravens, including Ray Lewis and Ed Reed. Michael Bennett did it in 2015 and 2016—and still played well enough to earn an extension from the Seahawks last December. Muhammad Wilkerson of the Jets did it in 2015, and still went on to have 12 sacks that fall. Last year, Stephon Gilmore of the Bills and Kawann Short of the Panthers were notable OTA no-shows. Gilmore signed with the Patriots this spring for $40 million guaranteed, while the Panthers forked over $35 million guaranteed to retain Short. Dolphins safety Reshad Jones? He blew off OTAs last year and played in just seven games because of a shoulder injury. Yet he still got $35 million guaranteed in a new deal this spring. You get the idea. Odell Beckham Jr., Aaron Donald, Fletcher Cox, Olivier Vernon, Duane Brown, Matt Jones, Eric Berry, Justin Houston, Marcus Peters—all have so far elected to skip all or a portion of this year’s OTAs, all for various reasons. Now ask yourself if, come September, you’ll be remembering that about any of them.